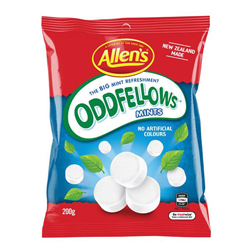 The world's best mints - Allens Oddfellows! And only 99% fat free. Cane Sugar, Glucose Syrup (From Corn), Gelatine, Maize Starch, Peppermint Oil. Rate this product and be in with a chance to win a £5 shopping voucher!